During these busy summer months a Family Calendar is a great way to keep track of your family’s changing schedule. Creating a family calendar will not only keep everyone informed about family events it will also set you up for success when it comes to achieving your summer goals! 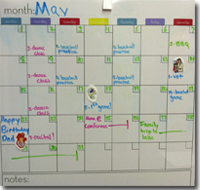 Get some tips from FOCUS for creating your family calendar in this article from Military Press! Moving is tough and can be quite challenging on kids who are leaving their friends and everything that they know behind. FOCUS has a few strategies that can be helpful for families whether this is your first move or your fifteenth.Check out our full list of tips and tricks to help make this move a smooth one. Taking time to recharge and take care of you is a key element to being the type of parent, spouse, partner, and friend that you want to be. This summer is the perfect time to work on incorporating activities that make you feel recharged into your routine. Check out this article featured in Military Press for some great tips from FOCUS about setting and achieving your self-care goals! This FOCUS Blog post was written by special guest blogger Crystal Arriaga. Crystal is a Military wife and mom from Houston, Texas. Read Crystal’s story to learn how FOCUS helped her family find new ways to understand each other and improve their overall resilience! Military kids often face unique challenges that can be tough to deal with. 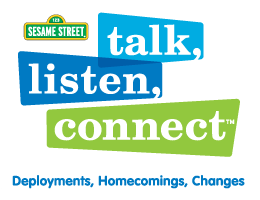 Sesame Street’s Talk, Listen, Connect series covers tough issues like deployment, separation, homecoming, and grief in a way that helps kids understand and learn how to deal with their own feelings about these topics. This engaging website includes videos, activities, and even parent guides to help you be there for your kids when they are feeling unsure.